You could stay at cheap Chicago suburbs extended stay motels and be miserable, or you could contact Premier Luxury Suites and live in one of our apartments or suites. The difference will amaze you. Our properties are designed to feel like home even when you are hundreds or perhaps thousands of miles away. Although we offer luxury extended stay accommodations, our prices are very affordable, so there is really no need to suffer anymore, when you are travelling or relocating. There really is a difference between cheap Chicago suburbs extended stay motels and Premier Luxury Suites properties. It is very hard to find a full kitchen in an extended stay motel. 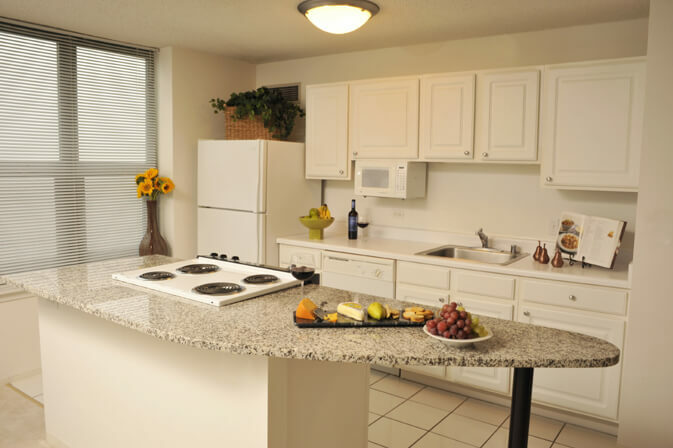 However, when you stay with us you could choose one of our suburban properties that offer a gourmet kitchen. You might think that you are saving money by choosing one of the cheap motels in the area, but the money you save cooking healthy food in your own kitchen will often out way any savings that you might get. In addition, we supply you with a kitchen that is ready to go with pots, pans, utensils, plates, and more. You will rarely find the amenities that Premier Luxury Suites has to offer. We have several suburban locations to choose from that are perfect for anyone that prefers a slower pace without a long commute into the city. Our options include some of the most popular areas in Chicagoland, including Northbrook, Deerfield, and Lisle. Many of our properties are pet friendly, so they are perfect for anyone that wants to keep their furry friends with them when they travel. Our two bedrooms are a great option for anyone that needs extra space. They are perfect for families that are relocating, and you will have a hard time finding cheap Chicago suburbs extended stay motels with this much space for everyone. We know that being away from home or relocating to a new area can be a stressful time. It is for this reason that Premier Luxury Suites has created the perfection option for your extended stay needs. Our properties include luxury appointments that will help you unwind, such as pools, outdoor space, workout facilities, and much more. We even have a property that offers a virtual reality golf simulator. How is that for unwinding after a hard day at work. There is no need to come home to cheap Chicago suburbs extended stay motels, when you could come home to Premier Luxury Suites. At Premier Luxury Suites, we are excited to have you as a guest, but we want you to feel at home. Whether you are enjoying our many amenities or relaxing in your apartment watching satellite television on your stylish sofa, we want you to make yourself at home. Do not let cheap Chicago suburbs extended stay motels lure you into their stuffy quarters with promises of low prices. There is no need to sacrifice your comfort, when there is an affordable home waiting for you at Premier Luxury Suites.